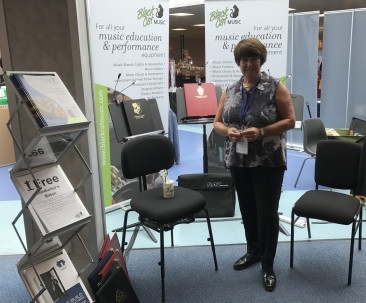 Black Cat Music was delighted to exhibit at the Scottish Association for Music Education (SAME) Conference on the 7th and 8th September 2017 in Stirling, Scotland. The two-day conference held at Stirling University, attracts delegates from all over Scotland within Music Education. The conference includes professional presentations, hands on training, and the chance to meet a wide range of exhibitors and stallholders. On show at the Black Cat stand were the ever-popular music and performance products ranging from Wenger music stands, a selection of seating, choir and band folders. Black Cat Music and Acoustics’ Senior Sales Executive, Brigitte Downs, was on hand to give sound advice on all their top selling products. Reporting on the conference, Brigitte Downs said “I very much enjoyed meeting the people at the heart of Music Education in Scotland, and thank them for their warm welcome. I hope that SAME’s 21st Conference was a success for everyone involved”.